They lived with locals, visited schools in Nouméa and in rural New Caledonia, learnt to cook a ‘bougna’, attended community events, and even gave speeches to education authorities in French…. Above, (l to r) Sheryl Everitt, Whakatane High School; Marty Hantz, Principal Taradale Primary School; Glenda Palmer, National French Adviser; Andrew Francis, Royal Oak Intermediate School; Donna Bowler, Somerville Intermediate School; Anne Passmore, Cashmere High School. They lived with locals, visited schools in Nouméa and in rural New Caledonia, learnt to cook a ‘bougna’, attended community events, and even gave speeches to education authorities in French. 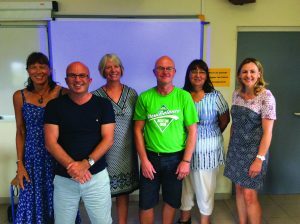 In April 2016 these New Zealand teachers spent two weeks in New Caledonia to immerse in the French language and to learn about the culture of this close neighbour of ours. Their backgrounds could hardly have been more diverse, coming from all over New Zealand, teaching at various types of schools, educating students at all year levels. Distinct as their jobs may be, they shared a common experience before travelling to the ‘Pacifique au Coeur’ – they had completed TPDL. Teacher Professional Development Languages TPDL caters for teachers of French, German, Spanish, Chinese, Japanese and Pasifika languages. It is a Ministry of Education funded in-service year-long professional development programme combining language study, second language acquisition pedagogy, and in-school support to enable effective language teaching. If you are a teaching a language and wish to spread your wings, apply for TPDL 2017. TPDL leads on perfectly to an immersion scholarship, also funded by the Ministry of Education. Learn more about the TPDL at tpdl.ac.nz.